"What does it mean to you to be called a “Christian”? What about your life is truly Christian? That is, how differently do you live from non-Christians on the things that really matter?" Good morning, friends, and welcome once again to Sabbath School Study Hour here at the Granite Bay Seventh-day Adventist Church in Sacramento, California. Very warm welcome to our online members, and those of you who are viewing this program via television across the country, and around the world. Also, I'd like to welcome our members and our visitors here for Sabbath school today, always good to see you. And today, we're going to be looking at the next lesson in our lesson quarterly dealing with the book of acts. We're actually on lesson number six which is entitled the ministry of Peter. Now, for those of you who are joining us online or watching this on television, if you don't have a copy of this week's lesson, just go to the amazing fact's website, just amazingfacts.com, and you'll be able to download a copy of the study, and you can read it together with us as we study God's Word. We do have a free offer that we like to let our viewers know about, it is a book entitled "the armor of God". Now there are two ways that you can get our free offer today. The one is to call, and the number is 866-788-3966, and you can ask for offer number 173, and we'll be happy to send you the book the armor of God through the mail. But if you'd like the book sooner than waiting for the mail to get there, you can also text the following code to the number. First of all, the code is "sh101", and you can text that code to the number 40544, you'll then get the link, and you'll be able to download the book in digital format, and you can read it right away. So we hope you'll take advantage of that, this is a great book entitled "the armor of God", and that is our free offer for our program today. But before we get to our lesson, we like to begin by lifting our voices in song. I'd like to invite The Song leaders to come lead us in our music this morning. We are excited to sing one of our favorites with you today, and I know that it is one of yours because I think this is one of the highly requested songs from around the world, "come thou fount of every blessing.
" You'll find that number 334 in your hymnals. So if you have those, join with us, we will do all three stanzas, 334. Thank you so much for joining with us and at this time Pastor Ross is going to have our opening prayer. Dear Father in Heaven, we thank you once again for the opportunity to gather together, and to open up Your Word, and study this important lesson, dealing with the book of acts, and in particular the ministry of Peter. We pray that your Holy Spirit will come and guide our hearts, our minds, for we ask this in Jesus' Name. Amen. Our lesson this morning is gonna be brought to us by our family life pastor here at Granite Bay, Pastor Shawn brummund. Shawn, we're just delighted that you are able to teach for us this morning, may God bless. Well, good morning to all. It's good to see everyone here as we come together to worship. As we have sung our songs of praise, it is a privilege to be able to stand in front of you here today. Every time I stand before you, it's always a privilege to be able to open the Word of God and to be able to guide us through some of these important truths that God wants us to be able to know. But today I have to say that I am extra privileged, and I am extra grateful to be able to stand before you because as many of you know, especially those who are local, as many that have been online watching this program or have been following on Facebook page for Granite Bay church as well as my personal Facebook page that I have faced some very real challenges. And before we get into our topic here today, I want to just confirm something that is important for all church members to be able to understand, and that is that pastors are subject to the same temptations and to the same trials as everybody else is. And the reason I say this is because over the years as a pastor I've discovered that there is a number of members that have concluded that the pastor's family is exempt somehow, and they just don't face quite the same trials and temptations as we do, that we are kind of in a special place somehow. No, we're all in the same special place under the grace and salvation of Christ, but we all face the same trials. As Jesus says, "do not worry about tomorrow, for tomorrow has enough things to worry about itself. Sufficient is today or the worries that we have, or the troubles that we have for today." And so that speaks to all believers including pastors. So I'm just very grateful that the Lord has restored me and has brought me through various serious neck health challenge and extensive operation. Now I'm back and I'm able to serve you and be able to look at this very important subject that we're looking at today. God is good and I'm thankful that he has restored me that I might be able to serve once again, but that's enough about the ministry of Pastor Shawn. We want to look at the ministry of something, somebody much more important, an instrumental apostle by the name of Peter. And Peter is no small a person. He is no small individual in the plan of God in the very first years of the Christian church. In fact as we look at the book of acts and some of us have been following faithfully through this quarterly so far, we have been reading chapter 1 through 12 which this particular week's lessons brings us up to the end of, and perhaps some of us have already ran ahead and read the whole thing, they got so excited. Acts is just one of those books where once you start to get into it, it's very hard to put it back down again, and you just want to see how it all ends. And so it's just a very powerful book. As we go through the whole book of acts, there are two individuals that stand out above all the other apostles. There are two individuals that are named more often by far than the other two apostles and that is Peter, where we're going to be studying in more extensively today, as well as Paul. I hear a number of you saying as well. And so Peter and Paul are the two key individuals that the book of acts focuses on more than any of the other apostles. Now, the apostle John comes to a close third I guess we can say, but nevertheless Peter and Paul seem to have the biggest part, at least the most prominent part of God's plan in the early church. With that being said, I want to ask you a question to stimulate your minds here a little bit this morning. What does the Bible say is the key difference between the ministry of the apostle Paul and the ministry of the apostle Peter? What is the key difference between those two individuals and the ministry that God had called them to? All right, I hear somebody saying jews and gentiles. All right, you're on track and I think I know what dianne is trying to tell us here this morning, and that is that God had called Paul to be an apostle to the gentiles. Now what is a gentile? Well, you know, some of us we know what a gentile is. You know, some of us that are here this morning, or that are watching online, or on the various television networks, they've never heard of the word gentile unless you've been exposed to church and to the Christian faith. And the reason is, we don't use that language, or that word outside of the Bible, or talk about the Bible in our modern vernacular today. So I know that by personal experience because I was raised secular, I wasn't raised in the faith, and so it wasn't till 20 or that summer I turned 21 that I gave my heart to the Lord and started to discover a real experience with Christ and with the Lord. And so I started going to church and I heard during Bible studies talk about gentiles, and I'm scratching my head saying, "what in the world's a gentile?" Well, a gentile is a non-Jewish person and so we have two populations of the Bible, in particular acts speaks about and that is that there is the Jewish population and then any other nationality or race, et cetera, religion, et cetera, would be under the umbrella of gentile. And so yes, you're right, Paul was called by God to focus his ministry on evangelizing and ministering most specifically to the gentiles. And then to Peter, God had called him to be an apostle to jews, the other population that was the most concentrated in his own country, the country of Israel. In Galatians 2:7-8, I'd like to read for you a statement that Paul himself had actually written, understanding this distinction and calling that God had given these two, it says, "but on the contrary when he saw that the Gospel for the uncircumcised had been committed to me…" now again, the uncircumcised would be those who are non-Jewish, "as the Gospel for the circumcised…" that is for the jews, was to Peter, "for he…" that is God, "who worked effectively and Peter for the apostleship to the circumcised also worked effectively in me toward the gentiles." And so I think it is important for us to understand that God had called them for a very specific priority or focus. Now for those of you who have studied last week's memory verse has found in acts 9:15, it's a bit of a review for us as we look at the statement made there by Paul as well. Actually, it's not by Paul, it's made by the Lord to a Christian by the name of ananias. And ananias was the Christian in the city of damascus that was commissioned by God to go over, find the apostle Paul, soon to be apostle Paul, he wasn't the apostle yet, but Paul was in a very serious situation because he was struck blind by God on the road to that city. And so God had commissioned ananias after two or three days of fasting and prayer that Paul was going through to go over and to lay hands on Paul, and pray over him, and pray that Paul would not only receive his physical sight back, but that he would receive his spiritual sight, that he would receive the Holy Spirit, and learn and experience what it is to be born again of the Spirit, something that Paul had yet understood nor experienced. And so we have this commission recorded in that particular verse, acts 9:15 where it says, "go for he is a chosen vessel of mind to bear my name before gentiles, Kings and the children of Israel." And so here we have the first priority which is again, the gentiles, and some gentile Kings, and some Kings that were either Jewish or at least half Jewish that he also was brought before in the future. But it also says that he was called to minister to the… well, to the children of Israel, and that would be the jews. And so I think it's also important for us to be able to understand that when you read the statement as well as look at their ministry, we discover that even though Paul was called to prioritize his ministry to evangelize and minister to gentiles. He also was found ministering and evangelizing jews as well. And the same goes with Peter, and so Peter spent most of his ministering time ministering to jews, but he also spent some real time ministering to gentiles, and we're going to be looking at that in this week's lesson study in the chapters of 9, 10, 11, and 12. All right, so we look at one of the key differences between the ministries of these two individuals. Now, what about Peter and Paul? And the next question I have is what did they hold in common in regards to their ministry? What did Peter and Paul hold in common in regards to their ministry? And I'll give you one more hint. It's something that God had called them in their ministry that was unique from the calling to ministry of the other apostles that are recorded in the Gospels. Okay, so what is unique in the ministering and calling of Peter and Paul that is unique and different from that of the other apostles, but what the two hold in common? Now the first one, you know, how I started with the easy question first. Okay, all right. Anybody want to venture a guess? Okay, I'm going to go ahead and share with you. The thing that they held in common was that God had, when he had called them into the ministry and into the position of apostleship, he had revealed to both of them some of the very real details that they would suffer from the world before they came to pass. And so at the beginning of their ministry, God and through Christ had revealed to both of them some of the details of the suffering that they would face in the future. Let's look at a couple of statements to be able to verify that here today. Okay, acts 9:16, now we just looked at the acts 9:15, the very next verse Paul goes on and says, or the Bible says. I keep saying Paul but it's not, is it? It's God that is speaking here. It says, "for I will show him how many things he must suffer for my name's sake." And so as Paul's continued to speak to the Christian ananias, he reveals indeed that at the beginning part of Paul's experience with Christ, and Paul later on in his epistles or in his letters that are recorded in the new testament, Paul talks about how God had taken him aside into arabia for a couple of years, and then he talks about how God had revealed multiple supernatural prophetic visions of truth, the messages that God had given to the apostle Paul. Well, when we put that together with the statement that is made here that God had planned to reveal to Paul the sufferings that he would suffer for his sake before it came to pass, we can very reasonably assume then that during those visions and during that personal time that Paul had with Christ that Christ had revealed many of the different things that he would suffer in the future for his sake. Well, did the same thing happen with Peter? Now I got your minds rolling, okay. Did the same thing happen with Peter? Did Christ revealed to Peter some of the things in details that he would suffer? Well, some of us might be thinking of the very last chapter of the Gospel of John, and if you are, that's what I was thinking of as well. In John 21, we find a very unique scene there that only the apostle John was inspired to record of all the four Gospels. And we find there that Christ has already resurrected, he had met his disciples on the shore of the sea of Galilee one early morning after they had been fishing all night. And after breakfast we find that Jesus now pulls Peter aside and he has a private talk and walk with the apostle. And as he is walking with him, he begins to share with him the sufferings that he would have. John 21 and we're going to look at verses 18-19 here this morning. Verses 18-19, it says, "most assuredly I say to you when you were younger you girded yourself and walked where you wished, but when you are old you will stretch out your hands, and another will gird you, and carry you where you do not wish." This he spoke signifying by with death he would glorify God. So it sounds a little cryptic in one way, but Peter understood very clearly because he had seen many times people that were executed in the same way that his Lord Jesus was executed just a few days or weeks before that. And, of course, when you're crucified, your arms or your hands are stretched out against your will, aren't they? And so here Jesus is revealing to Peter the manner in which he would eventually die for the Gospel sake. Now as it turns out, Jesus knew exactly what he was talking about, didn't he? Because traditional history tells us that indeed when Peter was in the city of rome and he was ministering there, we find that the roman officials had finally taken him and they said, "enough's enough." And so they decided that they were going to crucify him. Now the interesting thing about the historical or traditional historical story of Peter's crucifixion is that when they came to crucify him, he made a request to the roman soldiers and officials, and he said, "listen, you know, my Lord Jesus was crucified on a cross just outside the walls of Jerusalem, and I believe that he is the Lord of heaven and earth, and I don't believe that I deserve to have the same honor as him in being crucified in the same manner. Would it be possible for me to be crucified upside down?" And apparently that's exactly what happened. And so they had agreed to his request and traditional history tells us that Peter was crucified upside down. And so one of the lessons that we learned from this is kind of similar to my introduction as I shared about my own personal experience is the fact that when God calls us into the ministry, when God calls us into a more highly responsible position of influence in the church, it's not the same as being called to a more higher position of influence and responsibility in the world. When we look at the sports arena, or we look at the industry, or we look at the business arena, or we look at the political arena, when you find yourself in a higher position of influence and responsibility in politics, you know, typically that comes with a lot of perks. It comes with a lot of extra luxuries, especially in the business if you're in high position and ceo in a company, you have a lot of responsibility, yes, but you also have a very generous salary. You have all kinds of different perks and you're living in a nice house. There's all kinds of luxuries that come with that, but not in the Kingdom of God on earth, not in this world. When you're called to a higher position of influence and responsibility, typically that comes with a lot of sacrifice, and Peter and Paul are prime examples of that, aren't they? And so again, being in Christ, does that mean that life is going to always be easy? But the good news is that Jesus is always our strength. He is our rock. He is our refugee, amen? And so he is the one that gives us the strength, and gives us the courage, and gives us the persistence, and gives us the patience, and all these other attributes that we need to be able to make our way through some of these different trials, and sufferings, and temptations. And so that's the good news that we want to be able to focus on as we look at this here today as well. And so again, last week we looked at the conversion of calling of Paul, this week we're going to look at some key chapters that are focusing in on the ministry of the apostle Peter, and we're going to start in 9:32, 9:32, and we have a volunteer here today, my lovely wife has agreed to read that first Scripture, and then a couple of verses shortly after that as well. Go ahead please. "Now it came to pass, as Peter went through all parts of the country that he also came down to the saints who dwelt in lydda." Okay, thank you. And so, unlike some of the other apostles that find themselves stationed and kind of running things from the headquarters of the church which was established in the city of Jerusalem, a very natural establishment being the holy city, the capital of Israel, and what the jews understood to be the capital of the entire earthly kingdom of God established under Christ, for surely God has not called anybody but jews into the Kingdom, right? Well, some of you are looking and saying, "really? Well, I'm not a jew and I'm here." Well, you know, this is something that God had to work on in regards both to Peter as well as to the church, and we're going to look at some of those important details, and how Peter was an instrumental player in the plan, and the worKings that God knew he needed to do to be able to open up the minds and the hearts to the Jewish Christians to understand that the Gospel is for all peoples, all nations, and people from all walks of life. And so he is the international God of all the world, and that the Gospel is to go not only to Jerusalem, and to Judea, and samaria, but as he had told his disciples to the ends of… to the ends of the earth. And so it's very important for them to be able to come to understand that. So Peter doesn't find himself only working out of the office of the churches, synagogues, the temple and so on in Jerusalem, but we find that he is also an itinerant apostle. And so God had inspired him to go and to visit the various churches, and groups of believers, as well as to help evangelize to the different various Jewish populations in the cities and towns of Israel. Now in this case as we come to chapter 9, we find that Peter was inspired to make his way towards or close to the mediterranean sea. And so he just kind of southeast of what we call the modern city of tel aviv in modern Israel today, and that little town as we just read was called lydda or lydda. And today, by the way, if you go to Israel it's called lod, so it still exists, but the evolution of these names of these ancient cities have changed just a little bit. And so we don't know what stops Paul and Peter had before that, we don't know the reason why Peter had chosen and was led to go to lydda, but when we read the following verses after verse 32, we discover very quickly that God knew why he had sent Peter there and led providentially his tour to be able to arrive there because there was a paralytic that was waiting for him. And this particular man had been a paralytic for the last eight years, and really just left to exist as best as he can on a bed or on a mat. And we find that Peter was led to actually perform a miracle that was very similar to that of the Lord Jesus, himself. And so, denise is going to go ahead and read verses 34 and 35, and finish up that commentary for us. "And Peter said to him, 'aeneas, Jesus the Christ heals you. Arise and make your bed.
' Then he arose immediately. So all who dwelt at lydda and sharon saw him and turned to the Lord." Okay, does that sound familiar? As Jesus had talked to the paralytic that was lowered down through the roof in capernaum some years before as Peter had witnessed Jesus telling him, you know, "son, get up and walk... Arise and walk and take your bed." And here we find that the apostle Peter is doing the exact same thing. And so God is working in a very powerful way through Peter. Now as always, Peter is. .. And through all the miracles that Jesus worked, and that God then proceeded to work through the apostles was not to be able to entertain the people, it was not be able to wile them to sell tickets. There was no magician show. This was for a very specific purpose. And that purpose was to be able to win people for the Kingdom of Christ. And we find that confirmed for us in verse 35. It says at the end of verse 35, "and many who saw him turned to the Lord." And so many that either witnessed the miracle or had heard about the miracle in lydda began to consider the Gospel in a way that they wouldn't have considered it before. And by the way, this particular theme and statement that we find in verse 35 is prevalent and repeated in different ways all the way through the book of acts. Why? Because the book of acts, and the theme of the book of acts is to be able to focus on and give us a very strong and inspiring model on how to fulfill the commission that Christ has given to us. "Go therefore and make disciples of all nations, baptizing in the name of The Father, son, and the Holy Spirit, and teaching them all things which I commanded you, and lo, I am with you always. Teaching them to observe all things that I have commanded you, and lo, I am with you always, even to the end of the age." And so Jesus had given them a very large commission, and has given us a very large commission. And acts is the first plane out of that. And so over and over, it talks about how the word of the Lord grew daily where disciples and people being added unto the church and were being baptized. And so we find that theme all the way through this powerful book. Very important truth for us to be able to pick up as we continue on. Well, as we continue on through this particular chapter, towards the end of chapter 9, we find that Peter… I don't know what his next plan was, I don't know what his itinerary had said as far as his next stop on his tour after lydda, but we do find that God already had planned out his itinerary, and decided that the next stop that Peter was going to experience was right on the sea in a little town named joppa. Now joppa is a very fascinating little town that existed back in Peter's time, and I've brought a look couple of photos with me here today. And so I'm going to ask our av people if they can go ahead and put that first photo up. I had the privilege of actually walking and exploring for a couple hours through the town of joppa. Now today they don't call it joppa, but just like lydda has evolved into the name lod in modern Israel, ancient joppa is still existed in the same place but now they call it jaffa. Don't ask me why, but that's just the evolution of the name. And so you can see on the slide there that it says to old jaffa. So there's more modern small part of jaffa. And by the way, this is just a stone throw just south of the city of tel aviv. And so you don't have to go very far. And you'll find the city of tel aviv in modern Israel today. By the way, the individual that was up on that picture was the one that stayed with me after we went to a clergy tour for about nine days, I believe it was. Both pastor del border and myself had decided to stay and take about five extra vacation days, and to just explore old Jerusalem, and they go over to tel aviv, and joppa, and jaffa as they call it today, and explore through there as well. And pastor del border and he is also one of the board of directors for Amazing Facts, Canada. And so he was actually just visiting here in Granite Bay church, this last fall, and it was good to have him visit. And so if you can go to the next photo where we just kind of explored, and again, this is old jaffa. Now, I can tell you pretty well for certain that the building and the housing structure at jaffa today is not the same building structure that existed during Peter's time. A lot happens over 2,000 years, especially in a place like Israel where there is just countless wars between muslims and jews over the centuries and such. And many cities were flattened and rebuilt many times. But old jaffa here has been built several hundred years ago, and so we have something much closer to what Peter would have experienced. And then as we go to the next photo, we'll find that you come... After you go up that staircase and kind of explore through it, you'll find a little door there, and it really looks like somebody went to the local dollar store and bought some cheap paint and a cheap, you know, paint brush, and just kind of, you know, graffitied on their house of Simon the tanner. And then it says der gerber, and I hope I'm pronouncing that right. My wife is german, and her parents are german, and I looked it up in and der gerber is german for the tanner. Now if you look close enough, it says actually house of Simon the tanners. Now don't ask me why they put, "the tanners." I guess whoever was putting it didn't really know their Bible all that well. So the chances of that actually being the house of Simon the tanner where Peter actually lodged is pretty close to zero. But it's fun to have some traditional sites, and at least, you know, kind of get a feel of what it was like during Peter's time. Now the last photo that we're going to bring up on the screen here is one that helps us the most. And this would be the viewpoint that Peter would have had when he received the vision that we'll be looking at in chapter 10. And so there it is. You know, as Peter was up on the roof top, flat roofs were very common back then, even as many of the roofs here in old jaffa had flat roofs. And they would use that like a patio or a deck. And so Paul was up there at noon, and he had this beautiful view of the mediterranean sea. And I can see, Peter, as he stayed there for some time, you know, maybe joining the fishermen early morning for a couple of hours, and getting back to his old trade in throwing his net out into the water, and such but, that was the view that he would have had at noon when you see the vision. But before we see the vision, before he even got there while he was in lydda, there was a woman by the name of tabitha. And tabitha is aramaic for the Greek name which is dorcas. And dorcas is the name that more Christians are familiar with, but the Bible records both in this chapter. And so aramaic is tabitha, Greek is dorcas, english is giselle. Did anybody say, giselle? Okay, english is giselle. And so her name was giselle, if we were to translate it into english today. And so tabitha, dorcas, giselle was a woman that was an outstanding Christian. She had given her life to charitable deeds, and she spent a lot of time with the loom, and making by hand different garments or clothes for the widows that were in need in her city. Well, she got a fever and died quite quickly, and while they were preparing her body and such, some of the local Christians found out that Peter, the great apostle Peter was just down the road of the city of lydda or the town of lydda. And so they sent a contingency of a couple of men to go down and implore him to ask him to please come as quickly as you can and address the situation. And so Peter did exactly that. He packed up and he walked down the couple of hours or three hours or whatever it was to the sea side of town of jaffa or joppa, and he went into the room, and the widows were weeping, he sent them all out as Jesus did with jarrius' daughter, some years before, and then he knelt down beside her and prayed for her healing. And the Lord had decided to bring her back to life. And so, he gave his hand and brought her back to her feet again, and presented her alive to the believers there. Do you think that had an impact on the city or the town of joppa? Sure it did. You think the word out went out fairly fast? Sure it did, just like it did during the miracles of Jesus. And so we have another volunteer here that's going to read the concluding verses on that. And that is verses 40 to 43. Sorry, no, we don't have a volunteer for that. I'm going to go ahead and read those verses for you. In verse 40, it says, "but Peter put them all out, and knelt down and prayed. And turning to the body he said, 'tabitha, arise.' And she opened her eyes, and when she saw Peter she sat up. Then he gave her his hand and lifted her up, and when he had called the saints and widows, he presented her alive. And it came to be known throughout all of joppa, and many believed on the Lord. And so it was that he stayed many days in joppa with Simon, a tanner.
" And so again, many people believed on the Lord, that repeating theme all the way through the book of acts. Well, Peter here is spending some extended time now in joppa. He doesn't just do the miracle and says, "you know what? I've got to go. I've got another itinerary appointment on my tour. I've got to go.
" No, he stays by for an extended stay. Why do you suppose he did that? Was that because he wanted to just hang out with the fishermen there, and kind of get back into his old trade for a while? Well, again, maybe in the morning for an hour or two he did do that. I can see him doing that. But what did he spend most of his time in joppa doing? He would be baptizing, wouldn't he? He would be establishing and instructing these new believers that were coming because of the influence of the miracle that had just taken place in that particular city. And so God had a work for him to do as he was helping these different Jewish residents to be able to come to the Lord and be established in this new found faith that he had. And so that's the end of chapter 9 in this particular study. But Peter was soon to find out that God had already planned his next trip. Again, we don't know what Peter had planned before that, but God had already planned it, and Peter didn't know what was coming down the pipe, but God did. And this is one of my favorite chapters because we find the amazing providential timing of God as he orchestrates the events of chapter 10. Now chapter 10, it includes not only the city of joppa but also another city further up the same mediterranean shoreline. A city by the name of caesarea. And caesarea had an individual there by the name of cornelius. And cornelius was an uncircumcised gentile. He was a centurion. And he was in charge of a very large and important italian group of soldiers and so on within the roman military. And he was also a devote man that had already opened his heart to God. In fact, he was on record of fearing God, respecting God, worshipping him, and praying to God on a regular basis. He was also living out the fruits of his faith by helping and giving charitable alms and charitable donations to those who are in need. And so as one goes through the first verses of chapter 10, we find here that cornelius then has a very interesting experience because an angel of the Lord appears before him one afternoon at 3 o'clock while he's in prayer. Have you noticed so often in the Bible, God's people, when an angel appears, not all the time but quite often, they're in prayer? They're already in the presence of God. And lo and behold, this angel appears before him. And the angel says, you know, "the Lord has noticed your faith, your good deeds, your alms, your charitable works, and such. And there's an individual that I have, a very important apostle by the name of Peter that is just about 25 miles south of where you live, 40 kilometers south of where you live. And I want you to send for him because he has a very important message of truth for you and for your household. And he's going to explain to you how you and your household are going to be saved or can be saved.
" And so cornelius being a man of God already, and obedient to the Lord, obeys him immediately. He calls in two household servants, he calls in a soldier, probably to protect both the group on the way down as well as Peter on the way back, and says, "can you please go first thing in the morning and retrieve this individual by the name of Peter." God has given me a vision. He explains the vision. Well, as they're making their way the next morning on that long journey, 25 miles is no small walk. And maybe they went by horseback, but most of the time in those days they went by foot. And so that would take the better time about half a day. And so while they were starting off early in the morning to be able to retrieve this individual by the name of Peter, Peter comes to noon hour, and he's hungry as many of us are because it's lunchtime, and so naturally Peter is hungry. While he's kind of waiting for the dinner bell to go off and for the call for lunch to happen but he decides, you know what, I'm going to spend the time while I'm waiting up on the rooftop looking at the beautiful sea, and I'm going to spend some time praying and talking to God. And while he's up there praying before his Lord, God gives him the supernatural visual vision, and prophetic vision, and this sheep comes down out of heaven. And this giant heavenly size sheep is bound at the four corners, kind of like a bundle, so that it can hold its package inside. And as many have read the chapter, we find there that God then… the Bible describes that in the sheep, Peter sees all kinds of creatures. He sees animals, he sees birds, he sees insects of different kinds, and the unique thing that all of them had in common, was that they were all biblically unclean animals. In other words, these were animals that God had revealed from the very beginning of mankind's history and, of course, through Moses and through the Israelites that there's just some animals that God had never intended to be food. And so when Peter has seen this, you can kind of imagine him as a jew that understood this and avoided these animals as food all this time was kind of cringing a little bit as he saw all these different creatures. And then of all things, God gives the command. He says, "Peter, rise, kill, and eat." And Peter, kind of, you know, he revolts, and he says, "Lord, I have never eaten anything unclean or common. Don't you remember the very directions that you gave to us through Moses? And how even Noah understood this hundreds of years before Moses and the law of Moses that God had never intended these animals to be food. And so Peter doesn't obey. And so three times it says that God again... Three times in total God rose up and he said, "Peter, rise, kill and eat.
" And three times Peter refuses to kill and eat these particular animals. Now, as you come to that at that particular vision, we asked the question, the important question is, "did Peter understand the obvious interpretation and meaning of that particular vision?" No, he didn't. Now, one of the mistakes that I believe that many of us as Christians have made and myself being one of them for many years in my first years of experience as a Christian is that we read the vision, but we don't read the rest of the chapter. And we do something different than Peter does. We assume that the obvious meaning is that God is declaring now that that which he has forbidden for us to eat that was never designed to be food is something now that he says, "hey, rise, pull out the barbecue, and let's have some pork chops.
" Is that really the message, the obvious message that God was giving to us here? Well, some of you, who may be watching on this program here today, may be asking yourself and say, "well, that's the obvious message I've always understood." Well, again I was there. But one thing that happened was that a Christian came along in the future and pointed out that we need to read the rest of the story and allow the Bible to interpret it for us. Now let's go to verse 17. Because verse 17, we find Peter's initial reaction to the vision. In verse 17, it says, "now while Peter wondered within himself what this vision which he had seen meant, behold, the men who had been sent from cornelius had made inquiry to Simon's house, and stood before the gate.
" And so here we have Peter and he's scratching his head, isn't he? And he's saying, "what in the world did that mean?" The meaning wasn't obvious to Peter at all, was it? He didn't come, jump to any conclusion, so we shouldn't either. And so here we find that God's timing is perfect. At the very time that Peter ended his vision, lo and behold, the contingency from caesarea arrives and is calling for Peter. And so he interrupts Peter's deep thoughts, and he says there's... And he's told that there's three men that are waiting for him down in the front of the house. And so immediately the Spirit speaks to Peter and says, "that, I've sent them." Make sure you follow them, don't doubt anything, just do what they say, and believe everything that they tell you. And so they told him the vision and the angelic visit for cornelius, "can you please come with us?" And so the next morning Peter and six other men believers had joined Peter as they made their way back up to caesarea. Well, when they get to caesarea, Peter is finding himself in a packed house. And the house is packed not only with cornelius and his family, but he's invited every colleague and friend that he can possibly convince to come and hear the words of this great man of God by the name of a Peter. He's got a special message for us. And so Peter's in this room, and it's really crowded. Now even in an uncrowded house of uncircumcised gentiles, a jew like Peter felt very, very uncomfortable. Well, as it turns out, Peter confesses why in verse 28. Well, not only does he confess why, but he also gives us the interpretation of the actual vision. And so we have a volunteer. Rachel is going to be reading for us the punch line of verse 28 please? "Then he said to them, 'you know how unlawful it is for a Jewish man to keep company with or go to one of another nation. But God has shown me that I should not call any man common or unclean." Okay, thank you. So Peter is very uncomfortable because it's saying, it goes against all Jewish laws and traditions that I'm even in this house with you because you're uncircumcised gentiles. And then he says but in the meantime between the time that I received the vision in the town of joppa and my arrival here in caesarea, God's Spirit has made it clear to me what the meaning of the vision is. Does it have anything to do with barbeques? No, not at all. In case, it has everything to do with people. And that's where we need to stay. If we want to be Bible Christians in interpreting this vision, we need to stay with what the Bible says. Amen? And I want to encourage you as well, this is new to you, watching this program. And so here we find that Peter says the interpretation is that I should call no man common or unclean. Jews commonly called the gentile a dog. And that wasn't a flattering term that they use, they call them a dog because a dog is an unclean kind of... And they weren't friendly pets like we have today. Dogs were kind of mangy, kind of, scavengers that, you know, ran the streets of the cities of Jerusalem to feed, you know, feed on the garbage and the refuge and such of the alleys and streets. And so a dog wasn't even looked upon as a friendly kind of family pet. It was a very derogatory term to call a gentile a dog. Well, let's go to verse 44, and we'll look at the conclusion of the matter. Verses 44 to 46. And wayne is kind enough to be able to read that for us in the same chapter. "While Peter was still speaking these words, the Holy Spirit fell upon all those who heard the word. And those of the circumcision who believed were astonished, as many came with Peter, because the gift of the Holy Spirit had been poured out on the gentiles also. For they heard them speak with tongues and magnify God." Okay, so Peter is still in the middle of his preaching and all of a sudden what happens? The same thing that happened during pentecost. We have this down pouring of the Holy Spirit like Peter and the apostles experienced just a few months before. And now we find that these uncircumcised dogs, these gentiles, are receiving the same gift. How could it be that a gentile could be born again? As Jesus had taught nicodemus in the night. How could it be that these gentiles, who are still uncircumcised, could be saved and receive the Holy Spirit? Well, this is something that God was bringing Peter and the church to be able to come to grips with a very needed truth. Now it's true that almost for certain, cornelius and everybody in the house spoke the same language, latin or aramaic or Greek or whatever it was, they all communicated with each other on a daily basis. So they didn't need the Spirit of tongues or the gift of tongues in the same way that pentecost needed when the audience was an international audience of different languages. But the reason almost for certain that Peter saw them get the same gift was that Peter's mind was tied immediately back to what? Back to pentecost and to his own experience. And so when he saw them speaking in different languages, different international languages that they had never known before, why he immediately tied it in, and God tied it in his heart and said, "okay, that's it. It's synched up. I'm trying to get across to you that you need to be able to expand the Gospels to the uncircumcised gentiles as well." And that's the message that we find in this very important chapter. And it sets the stage for chapter 11. Peter arrives back in Jerusalem, but the word of his preaching, his eating, and he's baptizing many of these uncircumcised gentiles has already beaten him to Jerusalem. Word travels fast back then even without internet, and texting, and cell phones, and e-mail, and all the things that we have. It's amazing how quickly it got to Jerusalem even before Peter did. And so when Peter arrives in Jerusalem, he's in hot water, isn't he? And the first thing that the elders and the apostles do is they approach him and they confront him on and says, "is the rumors that we heard true? Tell us it's not true." You didn't go into the house of a gentile, uncircumcised gentile, and eat with them, did you? And then preached and baptized them? And so Peter is immediately forced into a speech of defense. And that's what he does. He recalls the story of cornelius, his experience with the vision, and then his experience with the household of cornelius. We come to the conclusion of that matter in verses 17 and 18 in the same chapter, chapter 11, I should say. And so dianna is kind enough to be able to read those two verses for us. Acts 11:17-18. "If therefore God gave them the same gift as he gave us when we believed on the Lord Jesus Christ, who was I that I could withstand God?' When they heard these things they became silent, and they glorified God, saying, 'then God has also granted to the gentiles repentance to life.'" Okay, thank you. And so Peter says how could I resist the working of God? It was obvious that God was involved in all this, and so how could I fight against it? And then we have that kind of dramatic silence that took place after he explained. And it's explained and it's recorded in verse 18. "When they heard these things, they became silent." And so there's the silent tense pause. How are these church leaders going to handle this very hot potato that God had just thrown into their laps, into their hands? And then we find that God's Spirit was there, they were sincere Christians and leaders of the church, and they said that God is also the gratitude of the gentile's repentance to life. Now we would think, okay, that matter's solved. Let's move on. Let's continue to expand the Bible, I mean, the church, and we'll baptize and evangelize as many uncircumcised gentiles as we possibly can find. Is that what happened? No, in fact, the Bible tells us as we read the rest of the book of acts as well as Christian history, there would be many years yet to come before the church would officially put it into the church manual. And so it was quite some time, and we're going to spend a whole week looking at a very important chapter. There's just a few chapters ahead. Acts 15, where the Jerusalem council came together, today we would call that the gc session or the general conference session. And as they came together for this general conference session, the apostles, the leaders, the elders, the delegates, they came together and they discussed it, and it said in a very hot dispute still, this very hot topic. And when it was all said and done, they came to a conclusion. And then it made it into the church manual. And so it took some time before that actually took place. But nevertheless, we find that God is patient, he's working upon his people, he's expanding the Gospel not only through Peter. And by the way, I don't think it's arbitrary that he picked Peter. He could have picked Paul to give the vision too, couldn't he? But he didn't have to convince Paul. Paul was already out there doing it anyway with barnabas. But he had to convince the most instrumental apostle of the jews which was Peter, wasn't it? Why? Because Peter was the one that was the most influential with the Jewish populations. So if God could sell Peter on it when he could sell the whole church a lot easier. And that's exactly what happened when we get to acts 15. We discover indeed that Peter stands up and he recalls and brings back to the memory of its delegates, the very experience that he had, pointing them to the example into the way that God had worked to be able to bring the Gospel to the uncircumcised gentiles. And no, they don't have to be circumcised. No, they don't have to observe the ceremony of Moses. They don't have to become a convert to judaism before they can enter into the salvation of Christ. They have an avenue that is available straight through Christ. And what a powerful truth for us today. Amen? And so it's good to be able to study these things. It's always exciting to be able to study the ministry of Peter. For those who are watching, we want to remind you that we have a free offer. 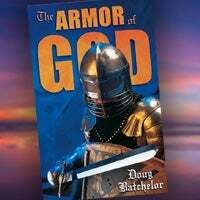 And if you're interested in continuing to grow in the knowledge of God, this is a book written by Doug Batchelor, the armor of God. And you just call into 866-788-3966 and you can receive that. Just ask for free offer number 173. We also have a digital download that's available. And you can text that on your phone to code, "sh101". And text the code, I should say, "sh101" and then you want to text it to the number 40544, that's 40544. It's always good to be able to study with you. I love you. God bless you. And we'll see you next week. Did you know that Noah was present at the birth of Abraham? Okay, maybe he wasn't in the room, but he was alive and probably telling stories about his floating zoo. From the creation of the world to the last day events of Revelation, Biblehistory.com is a free resource where you can explore major Bible events and characters. Enhance your knowledge of the Bible and draw closer to God's Word. Go deeper, visit the amazing Bible timeline at Biblehistory.com. Let's face it, it's not always easy to understand everything you read in the Bible. With over 700,000 words contained in 66 books, the Bible can generate a lot of questions. To get biblical straightforward answers, call into Bible answers live, a live nationwide call-in radio program where you can talk to Pastor Doug Batchelor and ask him your most difficult Bible questions. For times and stations in your area or to listen to answers online, visit bal.amazingfacts.org. Friends, are you afraid of heights? If so, you might want to look away right now. One of the most famous attractions in the san francisco bay area is the iconic golden gate bridge. While this world famous bridge was named as one of the seven wonders of the modern world. This is why the chief engineer Joseph b strauss was absolutely adamant about using the most rigorous safety precautions that it ever been used in bridge building. He had a local manufacturer of safety equipment, designed special headgear that he insisted be worn on every job. This became the prototype for the modern hard hat worn for the first time ever, but the safety precautions went even farther. Strauss provided a special hand and face cream to protect their skin from the cold biting wind and glare free goggles to protect their eyes. In addition, they also ate a special diet to help ward off dizziness when they were working at those epic heights. The devil would like to paralyze us with fear that we might fall or make a mistake, but we know that Jesus has provided a safety net for us and we don't have to be afraid. We can press on with confidence because the promise is in the book of Jude 24, he is able to keep us from falling. But sometimes we make mistakes, still don't be discouraged, friends, if you read in 1 John 2:1, the Bible says, "if we fall, if we sin, we have an advocate with The Father Jesus Christ. So let's press on together and build that bridge with Christ. Why did Lot give his daughters to the crowd?